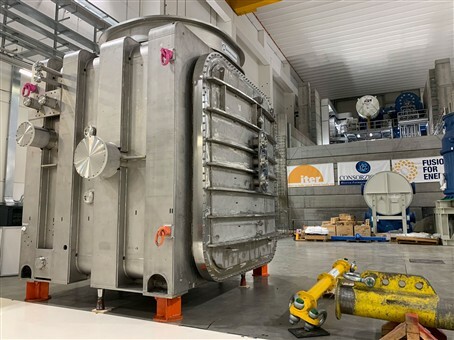 MITICA beam source vacuum vessel delivered to ITER Neutral Beam Test Facility, Consorzio RFX, Padua, Italy. The component has been manufactured by De Pretto Industrie and financed by F4E. Technicians performing the final acceptance tests of the MITICA beam source vacuum vessel, financed by F4E, and manufactured by De Pretto Industrie, Vincenza, Italy. The equipment is wrapped, loaded on the track and is heading from the Italian province of Vincenza to Padua – where the ITER Neutral Beam Test Facility is located. After nearly four nights on the road, the truck drives through the gates of Consorzio RFX where a team of technicians and engineers is expecting it. There is plenty of adrenaline in the air, enthusiasm and a feeling of satisfaction. The vessel has arrived home! The MITICA beam source vacuum vessel, financed by F4E, manufactured by De Pretto Indusrie, has been delivered to the ITER Neutral Beam Test Facility, Consorzio RFX, Padua, Italy. F4E is one of the main contributors to the MITICA experiment, and together with a long list of suppliers it is providing equipment and infrastructure to the ITER Neutral Beam Test Facility (NBTF) which is expected to bring fusion energy a step closer by providing insight to key technologies. Japan, India, ITER Organization, and Consorzio RFX, the host of the facility, are also involved by providing resources and equipment. The international collaboration underpinning the NBTF has raised high expectations amongst the fusion community. The tests to be carried out there are a game changer. In contrast to ITER’s toroidal vacuum vessel, the one for MITICA resembles a stainless steel rectangular box. In reality, it will consist of two containers welded together measuring in total 14 m long, 6 m wide and 5 m high. The beam source vessel, weighing 67 t, will house the equipment that will generate a full beam power of 17 MW. In spite of its straightforward square shape, its fabrication has been full of twists and turns because of a number of parameters needed to be taken into account. To begin with, its production was based on 100 drawings and roughly 180 tolerance requirements (ranging from few tenths of mm to a couple of mm along 5 m). Inner-view of the MITICA beam source vacuum vessel, financed by F4E, at De Pretto Industrie, Vincenza, Italy. The vessel counts 1 km of welds from which a good share of them had to be meticulously inspected. “One challenging aspect of manufacturing has been monitoring and controlling any deformations resulting from the welding,” explains Gonzalo Micó, F4E’s Technical responsible officer following the fabrication of the component. “As a result, measures had to be taken to contain any deformations and a lot of time was invested in checks and conformities. Remember there are several interfaces, cabling and bushing which will need to be connected to the vessel to deliver the high voltage power supply. Last but not least, this vessel needs to reach the required level of vacuum for the experiment and avoid having any trapped volumes or contamination putting in danger the operation of the equipment. Therefore, an extra layer of manufacturing prerequisites had to be met,” he adds. For Mario Ciscato, CEO of De Pretto Industrie, the successful completion of this task was a moment of immense satisfaction. “Throughout the project we faced many challenges – from the large size of the component to the extremely tight tolerances to be achieved. Through the implementation of special processes in welding and machining we were capable to reach the accuracy required and to cope with unexpected modifications during the fabrication of the vessel. Finally, the vacuum requirements for this first of a kind NBI vessel were met since the first testing thanks to the dedicated vacuum testing device with automatised control developed by De Pretto Industrie. We would like to thank all staff involved in this great adventure and our partners (RFX, F4E and ITER) who contributed to this achievement,” he explains.